As a certified installer of Connor wood floor systems, Schmidt Athletic Floors offers wood systems to meet a wide range of needs for an array of activities, levels of play, budgets, and facility size. We are certified by the Maple Flooring Manufacturers Association (MFMA), making us the preferred installer of wood gym and athletic floors in Wisconsin. 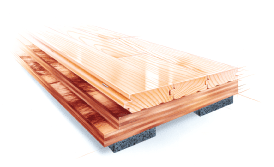 Fixed resilient wood floor systems combine the bounce and stabilizing benefits of anchored subfloors with the resiliency and shock absorption of floating systems. We offer a wide range of Connor fixed resilient floors, fitting an array of needs for budget, activity, facility size, level of play, and more. These systems are considered the premier choice for gym flooring systems because they offer the benefits of both fixed and floating systems with none of the drawbacks. 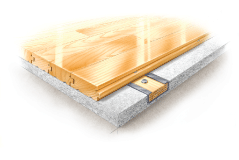 Fixed systems are mechanically fastened to the concrete substrate, providing a highly-stable subfloor which offers outstanding buckle resistance and minimal resilience. These systems can be a good choice for use where there may be an issue maintaining a consistent internal environment where floating wood floor systems might buckle. 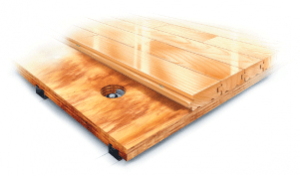 Floating wood athletic floor systems are not directly anchored to the concrete substrate, offering varying levels of resiliency through different combinations of pad and subfloor designs. These floors deliver key benefits in shock absorption and resiliency at a cost-effective price point, but they do not provide the stability or uniform resiliency of fixed resilient systems. Please contact us today or call us at 262-547-8763 to Learn More about our residential flooring products,services, and capabilities.